cousin connor. | there's no place like gnome. I went to my Wisconsin home. And now I’ve come back. I said goodbye to cousin Connor as he departs this coming weekend for a semester [or perhaps even a year] in Ghana. Connor, my birthday cousin, loves chocolate cakepops. 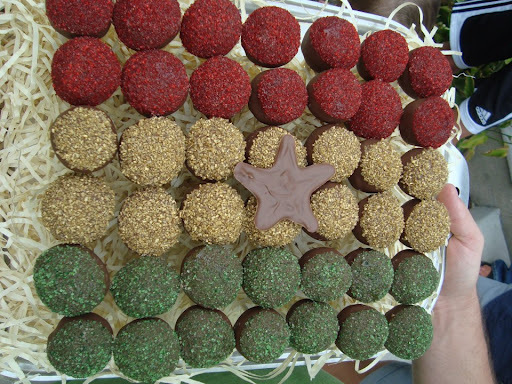 In honor of his awesomeness, I made him a set of cakepops meant to resemble the flag of Ghana. I walk up the driveway with the pan of cakepops and show Connor. Look, it’s the flag of Ghana! Seems he would have been happy with just a bunch of pops in a bag. It will be so strange for him to be gone for so many months, or even potentially a year. He’s my Thanksgiving bake-off buddy and the one with whom I share my December 8th birthday. He’s pretty fun too. We went to a movie together while I was home [along with two more cousins and a sister] and I just enjoy him. He’s a pretty great kid. He’s one who was freaked beyond belief that I was going to spend three weeks in Tanzania, only to follow me to Africa for three summers in Kenya. He’s made some great connections in Kenya and has actually started an organization to help people in Africa. Check it out and if you have any old cell phones to donate, let me know and I can get them to the right place.